Amitayus Incense Powder is handmade from carefully harvested Himalayan herbs, oils, resins and spices in accordance with traditional methods and formulae. Primarily used during spiritual ceremonies and meditation sessions to purify the environment, to create a peaceful and calm atmosphere and as an offering to Amitayus, the Buddha of Infinite Life, to invoke his blessings of longevity, good health, peace and joy. 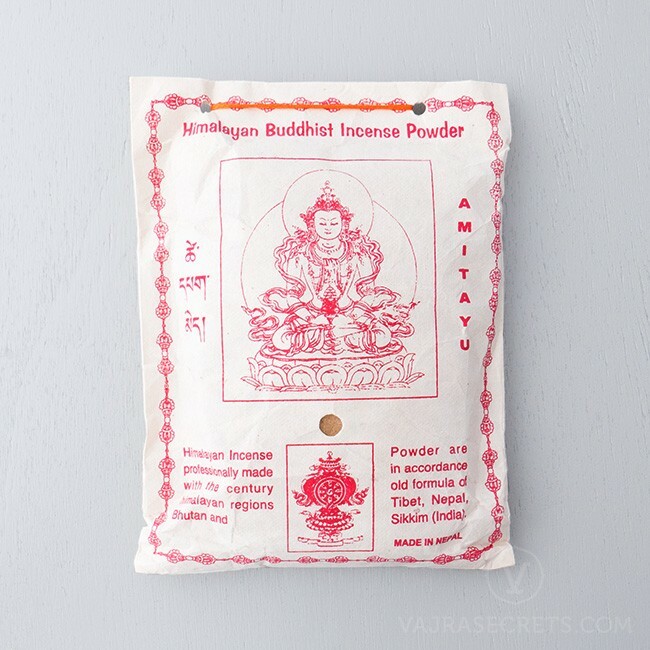 Amitayus Incense Powder has been carefully hand-made to meet the highest standards of quality, following a strict formula found in an ancient traditional text from a variety of medicinal herbs, oils, resins and spices from the Himalayan mountains. Prepared under the supervision of the eminent healing lama, H.E. 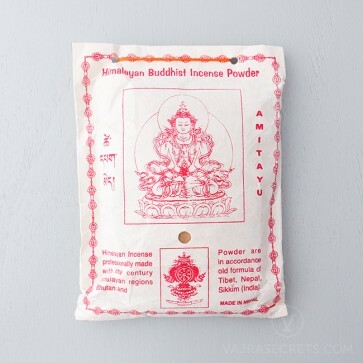 Gangchen Rinpoche, Amitayus Incense Powder releases a mellow herbal aroma when burnt. It is a particularly suitable offering to Amitayus, the Buddha of Infinite Life, to invoke his blessings of longevity, good health, peace and joy. This popular herbal incense is excellent for cleansing and purifying the environment of unwanted energies and to aid relaxation and stress-relief. It is also particularly used during spiritual ceremonies and meditation sessions to create a peaceful and calm atmosphere.